The music of Peter Fribbins combines a gift for melody, drama and passion with a direct and clear musical style. Born in London in 1969, he won a scholarship to the Royal Academy of Music, subsequently studying at Royal Holloway and Nottingham University, and with Hans Werner Henze in London and Italy. His works are regularly performed nationally and internationally, including the US, Canada, Eire, France, Belgium, Germany, Denmark, Norway, Austria, Switzerland, Italy, Cyprus, Poland, Czech Republic, Lithuania, China, Japan and Australia. Many pieces are available on recordings, particularly on the Guild, Sheva and Resonus labels, including the orchestral works Capriccio, the Piano Concerto (recorded by the Royal Philharmonic Orchestra) and Soliloquies for Trumpet & Strings. 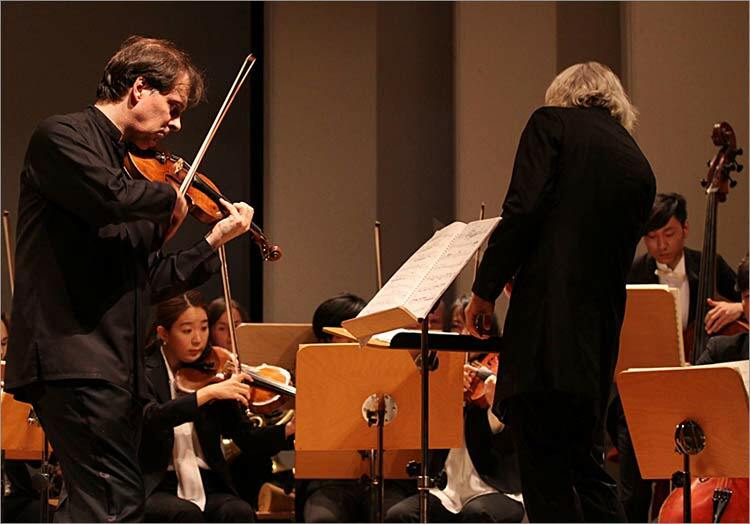 The Violin Concerto, incorporating a fragment of a Purcell pavane as an idée fixe, and premiered by Philippe Graffin and the English Chamber Orchestra in 2015, was issued on a highly acclaimed recording [hyper-link] by the Royal Scottish National Orchestra, conducted by Robertas Šervenikas, in 2017. Fribbins’ string chamber works include two quartets, I Have the Serpent Brought (after the poem ‘Twicknam Garden’ by John Donne and recorded by the Allegri Quartet) and After Cromer (recorded by the Chilingirian Quartet), as well as two piano trios – the latter titled Softly in the Dusk after a poem by D.H. Lawrence and premiered at the Wigmore Hall in 2007. 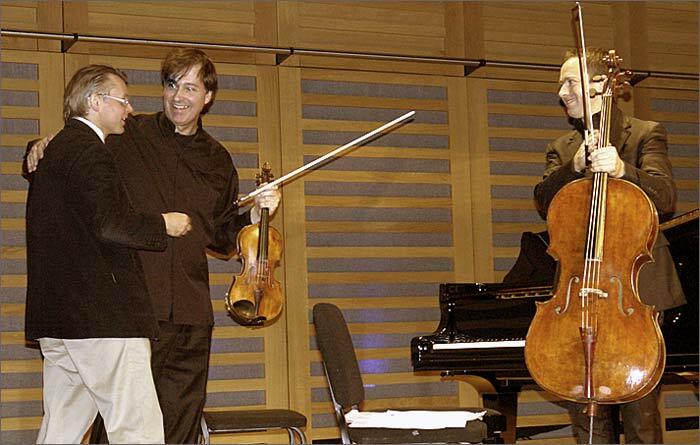 The Cello Sonata was recorded by its dedicatees, Raphael Wallfisch and John York, and the Sonata for Solo Violin premiered in Florence by Alberto Bologni, subsequently recording it for Sheva in Milan. Dances & Laments, premiered in France in 2010, is a widely-performed duo for violin and cello, and ‘…that which echoes in eternity’ (after Dante) is available in versions for violin or cello and piano. There is also a Quintet for Clarinet and Strings (in the repertoires of the Allegri, Solaris, Barbirolli and Afiara quartets), and the hauntingly beautiful Fantasias for viola and piano. Chamber works for wind include the wind quintet In Xanadu (after Coleridge), and the dramatic Flute Sonata Porphyria’s Lover (after Robert Browning) – recorded by Nancy Ruffer and Helen Crayford. 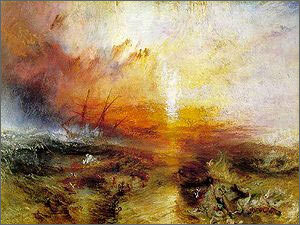 There is also a Brass Quintet, premiered by Onyx Brass, and the mixed septet The Zong Affair – after the evocative 1840 painting ‘The Slave Ship’ by William Turner. Keyboard works include the Nocturne for piano (recorded and widely performed by Alessandro Vena), the Prelude & Fugue for organ after the hymn tune ‘Cromer’ and a number of smaller piano pieces, including the celebrated A Haydn Prelude – written in 2009 to commemorate the 200th anniversary of Haydn’s death and dedicated to the British composer John McCabe on the occasion of his 70th birthday. 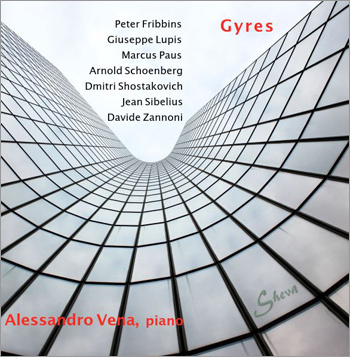 Published in an anthology of pieces by six other British composers (Haydn Fantasies, Music Haven), it achieved worldwide recognition as a supplement to the International Piano Magazine. Premiere of ‘Haydn Fantasias’ at the Presteigne Festival. 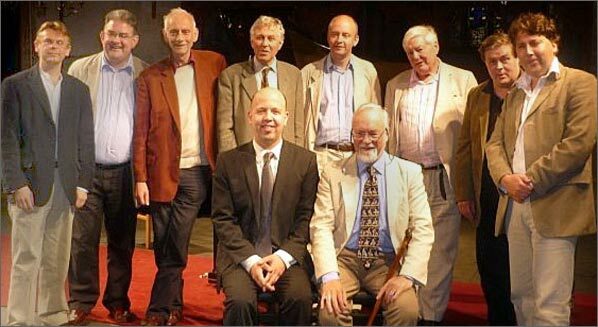 Front: Huw Watkins (piano) and John McCabe. Matthew Taylor, Hugh Wood, Alan Mills, James Francis Brown. 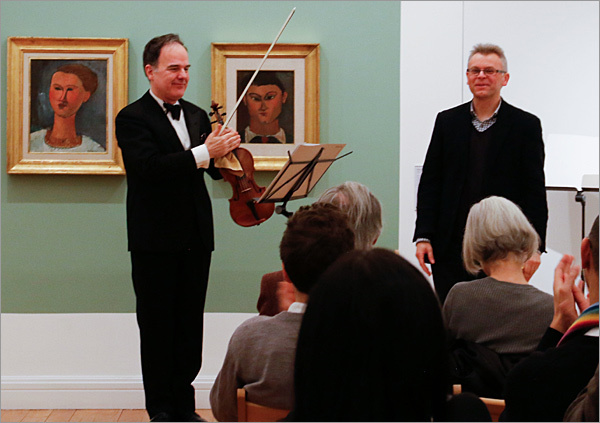 The Italian pianist Alessandro Vena gives the Austrian premiere of the Nocturne in Vienna, and Alberto Bologni performs the Violin Sonata in London. 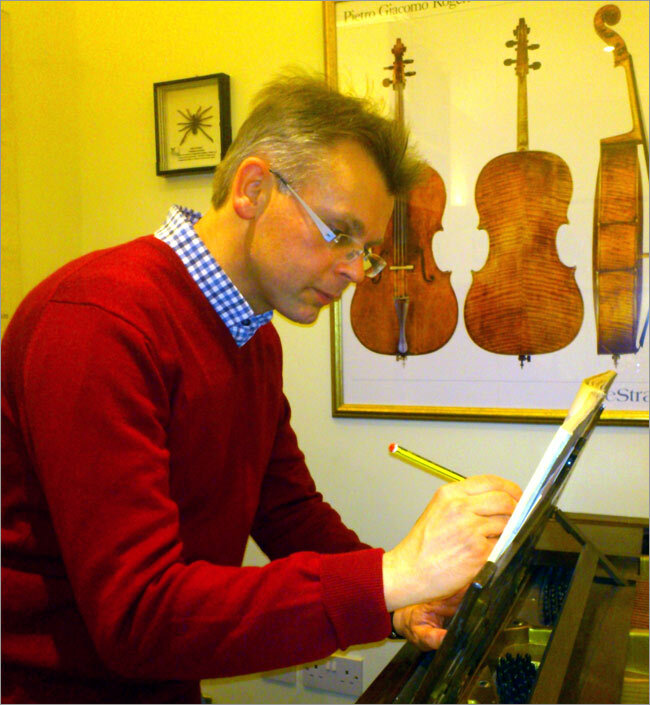 Peter Fribbins is delighted to be one of the featured composers in the Hertfordshire Festival of Music in June, with four of his works being performed. As well as a composer, Peter Fribbins is Artistic Director of the celebrated Sunday series of London Chamber Music Society concerts, resident at Kings Place. 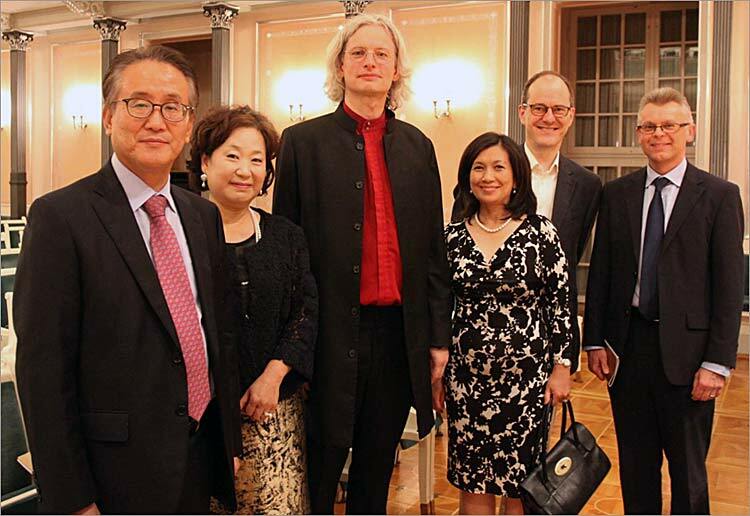 In 2017, he was made Professor of Music at Middlesex University. The UK première of ‘Dances & Laments’ at Kings Place (Graffin & Demarquette). World War II German submarine base in St Nazaire. Peter was delighted to be awarded the medal of the town for the gift of the new commission!